In a short while, we’ll "visit" with the disciple Thomas, using our imagination to remember how hard it was for those first followers to fully comprehend that Jesus was alive. This continues to be a challenge for believers, even today. Concerning this man we will "meet" after the next hymn, we have not received all that much biographical material on Thomas in the Bible. He is but a name in the middle of the list of the twelve disciples in the gospels of Matthew, Mark, and Luke, and in the book of Acts. 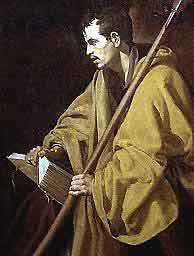 It’s only in John’s gospel that his character is fleshed out a bit. There he is also called "Didymus," a Greek word which means "twin." In fact, the name "Thomas" is a transliteration of a Hebrew word which also means "twin." Apparently being a twin was a significant part of Thomas’ identity, but who his twin brother or sister was remains a mystery. This riddle must have captured the imagination of someone in the early church, for in the third or fourth century a book called the "Acts of Thomas" began circulating in which he is considered the twin of none other than Jesus of Nazareth. While intriguing, the early Christians knew better than to give this idea much credence. Like another work that didn’t make it into the New Testament, the "Gospel of Thomas," this fanciful story of how the good news reached India is interesting, but not true to what we have received in the Bible. For instance, it begins with Jesus selling a reluctant Thomas as a slave to a man who needs a carpenter back home in a distant land. If you hear echoes of the story of Joseph in the Old Testament being sold by his brothers into slavery and taken to Egypt, that’s probably intentional. 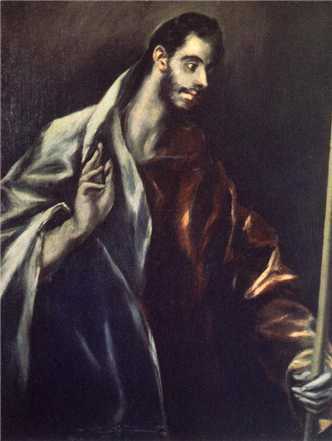 Our imaginary "Thomas" this morning will stick a bit closer to the word picture of him painted by the gospel of John. However, we’ll slide a little on this "twin" enigma, fleshing it out more than the Bible does. Please know, however, that the answer to the riddle of why Thomas is also called "Didymus" is not some sort of secret knowledge necessary for eternal life. "Faith," after all, is not a secret - as the following story reveals. It boils down simply to trusting in something (or should I say, in "someone") you can’t touch or see. Listen to gospel storyteller John tells about the first day of resurrection. Shalom, I’m Thomas! ... You’re supposed to say, "Hi, Thomas." ... My story? It seems to be the story of my life that I am always a step behind everyone else. For instance, somebody tells a joke. Can you guess you always seems to be the last person in a group to get it? ... Me. When something significant is said, everyone else eventually gets around to that "Aha!" moment when the truth of a statement dawns on their awareness - before me. It takes me a while. I have to mull it over, ponder it, wrestle with it. In a way I need to "touch" something before I get around to an "Aha!" It’s always been that way. I always seem to arrive late. My parents always said that’s the story of my life. Mother even linked it back to the day of my birth, when my brother and I - we were twins, you know - were in the womb. He was ready and raring to go. I took my own sweet time to be born. Father said that was a characteristic true of all my growing years. Where my brother was first to volunteer an answer in Sabbath school, I’d wrestle with the answer much longer. He was always ready to jump into something. Me? I’d get there ... eventually. I wasn’t a lazy sort, mind you. I do good work. I just take my time. As a craftsman, I want what I do to be right. I’ve been told that "you never need to ask Thomas to redo anything. When it’s done, it’s done well." It just takes me longer to get there. Unlike him. It’s not that my brother was way smarter than me, though sometimes it felt that way. I wasn’t dumb. He was just first to arrive. Some might call it "impetuous." It was his downfall, really. Remember the rebellion against Rome a number of years ago? He quickly joined the zealots when some of them came to town seeking recruits. While I saw the importance of freeing our homeland from the Roman invaders, I just wasn’t ready to enroll in that band of guerilla fighters, like my brother. He went off. We never saw him again. They say that when the uprising failed, he was strung up on a cross outside Jerusalem, like all the others. That was how Rome maintained order - making examples for everyone to see what happens to rebels. A bit of me died then. I stopped going by "Judas," as my folks had named me, and took on my nickname - the twin, "Thomas." That’s who I was when Jesus called my name a few years later. The teacher came to our town, like the zealots before him. I confess, true to my nature, I wasn’t quick to jump on board. It took me a while, but eventually I became his disciple, leaving my home behind, like the others. He was a marvel - his miracles, his stories. I didn’t always understand the things he said. Often, in fact, his words went over my head. Had to ponder them, mull them over, wrestle with them, touch them (if you will). Like after we received word that Lazarus was deathly ill. We all thought that since Lazarus and his sisters (what were their names? ... Mary and Martha) were such close friends of his that he would immediately take off to Bethany where they lived. He’d healed others, why not his good friend? But no, we just continued on our way elsewhere. A few days later he started talking about going to Judea - you know, toward Jerusalem. That’s where my brother was crucified. It’s not really where I wanted to go. Too dangerous, for us and especially so for Jesus. But that’ s where he said we were headed. Okay. Then, in the middle of the conversation he noted that Lazarus was now dead ("asleep," he said at first), and it was time to go to Bethany. "For your sake I’m glad I wasn’t there," he said, "so that you may believe. Let’s go!" ... What? He was glad not to be able to heal his friend? This made no sense to me, so I blurted out. "Fine! Let’s go, that we might die with him!" It was a stupid thing to say, I know, but as I said, I’m always a step behind everyone else. Later, once we were in Jerusalem, he sat us down and started talking about where we were now - or should I say, where he was now heading. "Don’t be troubled," he said, "trust me." And then he spoke about going to his father’s house which, he said, was really big. There was room for everyone. Was he talking about the place his mother now lived in Nazareth? Was he talking about the Temple? What did he mean? I didn’t know. "I go to prepare a place there for you," he said, "that where I am you may also be. And you know the way to the place where I am going." Huh? I had no idea what he meant. Where was he going? All I could see was what happened to my brother. "Lord," I said, "we don’t know where you are going." Well, at least I didn’t. "How can we know the way?" Then he said those words that I’ve wrestled with ever since. "I am the way, and the truth, and the life. No one comes to the Father except through me" (arms are spread wide as this line is spoken, as if on a cross). Through him? What did he mean? (see John 14:1-7) ... Well, you’ve no doubt heard what happened to him. Like my twin brother, he was strung up on a cross outside Jerusalem. When things started falling apart, and he was arrested, and our hearts were, indeed, troubled. An understatement. We were deathly afraid. Ran off like frightened rats. A few days after his horrid death, we were brave enough to secretly meet together. On that morning the woman told a strange story. They had gone to prepare his body and found the tomb empty. Peter and John checked it out. What did it mean? Had someone stolen the body? I went to find out what I could from my sources in town, but none of them knew anything about who might have taken his body and where. When I returned that night, I opened the door on a group of wide-eyed idiots. "Jesus was just here," they said, "you just missed him" (the story of my life - always a step behind everyone else). No! I’m not going to fall for some mass hysteria. Jesus was just as dead as my brother. For God’s sake, he had been nailed to that crosspiece. It’s my nature to wrestle with such things, you know. 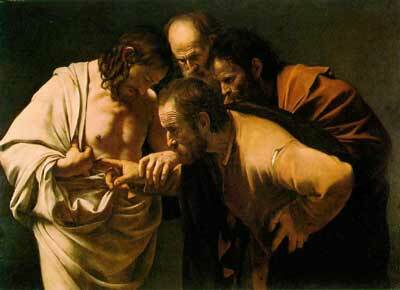 "Unless I see the marks of the nails in his hands, and touch it, I will not believe." I can be stubborn. It was a horrible week. Everyone else was higher than a kite. I was depressed. A week later we were back in the same place, when Jesus came again. This time I was there. "Shalom!" he said, "Peace be with you." And then he turned directly to me. "Thomas, my brother." I could hardly believe my eyes. He told me to touch his hands and his side, where there were still traces of his wounds. "Do not doubt," he said. "Trust me ... believe." What do you say at a time like that. You know the way. Finally, I arrived. Aha! "My Lord and my God!" My friends, it may have taken me awhile, I might have been a step behind everyone else, but I got there. And the rest, as they say, is history. I’m certainly no smarter than any of you. I do however, have the advantage of having been there. Even then, however, I wrestled with the resurrection. Maybe you do also, and you weren’t able to see and touch him like me. Trust me. No, I mean, trust him - even when you can’t see. Allow me just now to pass on the you the blessing he shared that day. "Have you believed because you have seen me?" he asked, looking me in the eyes. "Blessed are those who have not seen and yet have come to believe." Indeed, the Lord has blessed you. Trust him. He’s alive... Shalom! Peace be with you. When it comes to why this disciple was known as the "twin," an interesting parallel may be the Old Testament story of those twin brothers, Jacob and Esau (Genesis 25:21-34, 27:1-45, 33:1-17). I have somewhat patterned the above on that relationship, wondering if - by repeating the meaning behind Thomas’s name (Te’omâ in Aramaic, Didymos in Greek) - our gospel storyteller John wasn’t trying to connect with the children of Jacob who, after wrestling with an angel beside the Wadi Jabbok, was renamed "Israel" - "one who contends/wrestles with God" (Genesis 32:22-32). Sidelight - A highly imaginative "biography" of Thomas can be found in the "Urantia Book," which supposedly "presents a major advance in human understanding of spirituality and the cosmos in which we live." Where did this information (most of which is in no earlier work and in many cases contradicts both the New Testament and other non-canonical material) come from? "Compiled by an editorial staff of superhuman beings," it says, "the (Urantia) text provides a comprehensive perspective of human origins, history and destiny." Seems gnosticism is alive and well. I first came across this work as a young pastor ministering to a family with a dying child. One parent had found this book in a store and appreciated the "answers" it readily provides for questions the Bible leaves open. I appreciate this about the Bible as we have received it. Call it space for the Holy Spirit and our imagination to move. However, there are always those ready to fill in all the blanks. Hopefully the above is not taken as such. For commentaries consulted, see John.